I have been attending sewing classes with Sue for several months now and have learned so much. As a beginner sewer who struggled to correctly thread my machine and had no idea how to read a pattern I was apprehensive about attending sewing classes in case I didn’t know enough and wouldn’t be able to keep up. However Sue is a very patient, enthusiastic, encouraging and brilliant teacher who is professional in her approach and clearly very knowledgeable about all things related to sewing. She always takes the time to explain everything in clear simple terms and easily adapts her explanations to make perfect sense regardless of your level of experience. In addition, small class sizes mean that she is able to spend plenty of time with everyone in the class. And, as you select your own projects, you are learning whilst making or altering something of your choosing which makes the classes excellent value for money. 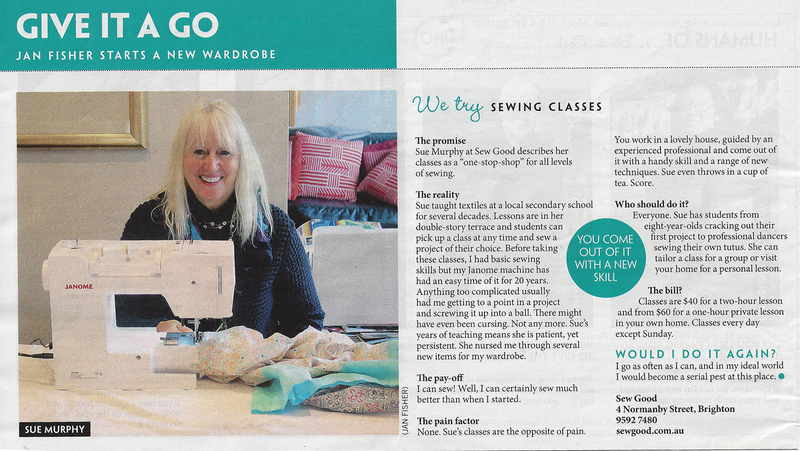 I would highly recommend Sue and Sew Good to anyone wanting to learn to sew or wishing to advance their sewing skills. An honest review of my thoughts and experience – Pros Location: Fabulous – free parking which saves both time and money; Cost: I searched Melbourne and you won’t find any cheaper; Talent: Highly qualified, motivated and outstandingly talented; Personality: Friendly, calm and extremely patient – A+; Availability: Very accommodating and deserves the same respect. Con If you are a super shorty like me please don’t hesitate to ask Sue for a pillow to sit on as the chairs are a little low for the table. It is important to be comfortable and Sue will help you with this. My daughter and I have been going to Sue for several months and have found her to be an excellent and patient teacher. I found her through GumTree and I was a little nervous about what to expect but have been very happy. I’d highly recommend Sue and Sew Good. I was very aprehensive when I booked in for my first sewing class with Sue because I had absolutely no idea how to thread a needle let alone sew a something ! I was afraid I would be a nuisance. I shouldn’t have worried because from the second Sue opened the door I was instantly put at ease and made to feel welcome . Each week I gained so much knowledge and started making things I never dreamt I was capable of. After only 3 classes I proudly wore home the first blouse I had finished, my family were amazed !! I highly recommend Sue as a teacher, her classes are small. We have lots of fun learning so much in the relaxed and happy atmosphere of her gorgeous home . Sue never wearies of me asking her the same questions over and over, whilst she is very professional we also have lots of laughs and sewing class is always fun. I look forward to my classes in 2014. Thanks so much Sue. Penny a student emailed me this lovely review tonight. She did not want to have to go through the registering process required on Hot Frog, WOMO online etc…. SewGood sewing classes started off as an interest and hobby but has since has changed my life. I didn’t even have a working machine when I started SewGood sewing classes. Sue was very generous lending her machine until I found & purchased a new one of my own (which she also helped me with). I barely knew how to thread a machine before I started sewing classes. But with Sue’s kind and patient guidance I soon learnt about the grain of fabrics, cutting, reading patterns, different stitches and seams and much much more. Sewing with Sue is very relaxed in a comfortable and friendly environment. What I gained in knowledge that I’m now using for my business is beyond what I ever thought I would learn. So if learning to sew has ever interested you, do not hesitate to give it a go with SewGood sewing classes. Thanks Sue, I have loved every minute of sewing with you! I can honestly say I look forward to Thursdays when I have my class with Sue. She always has a smile on her face,so helpful, very very patient and very encouraging. Her knowledge appears to be endless. Sue has taught me how to make garments from scratch, and importantly instead of paying for new clothes (because your size has changed) just alter your favourite jeans, skirts, dresses and tops that you still love. I have also made some gorgeous Birthday cards, that I have great pride in sending to family and friends, just something that is extra special .I recommend just trying one lesson with Sue and I guarantee that you will be back and have a great experience. Sue Murphy was my year 12 textiles teacher in 2010. I decided to make a quite intricate, time-intensive Mad Hatter’s Costume. She never doubted my abilities for a second and constantly encouraged me. Without a doubt the best textiles teacher I have ever had. Her dedication to our class was impeccable; She came in at lunchtimes and weekends to help us with our garments. She wanted us to succeed and create something beautiful that we were proud of. We all achieved that. We all felt so fortunate to have her as a teacher, mentor and friend that year. She is one of a kind! Sue is such a lovely lady. What a wonderful sewing instructor. She has such patience with me even when I get so frustrated with myself because I just couldn’t sew in a straight line. She gives me the confidence that I need & I have someone to share my ideas & show off my finished projects to. It is “SEW GOOD” to have someone guide you in such a professional way. It’s pretty obvious she’s been a teacher for a long time,she has the patience of a saint. I’m really impressed with myself for finding her. She had an ad. on Gumtree & she has a great set up at her place. I could take my own sewing machine but she helped me out with equipment & things I forgot. She has me better organised with my sewing kit now. And Sue showed me some great things I can do with my machine, like using a twin needle that I never knew about. I’m getting better at sewing my straight lines & doing things I always wanted to do. I can’t praise her enough or myself for getting so lucky in finding the right person! Seriously, if you need someone one on one or for a group you couldn’t do better than Sue. Look up Sew Good. Sue is a wonderfully kind person, generous with her time and knowledge. I was apprehensive initially but I was soon put at ease by this this gorgeous girl. I honestly held little hope for my ability to understand the complexities of a sewing machine let alone cut out a pattern and make a garment ! But here I am 3 months later, having cut out and made many new pieces. I look forward to our lessons so much. It ‘s often the most fun part of my week ! Sue has taught me so much about sewing. I hadn’t done sewing for such a long time and the lessons I had with her really helped. She has not only helped me with working out patterns but also on how to alter them for my needs. She was also incredibly helpful and sourcing me patterns. We have done a ball gown and a costume similar to a school uniform and I would never have been able to do them without Sue. She is incredibly helpful and that is what makes her lessons so enjoyable.